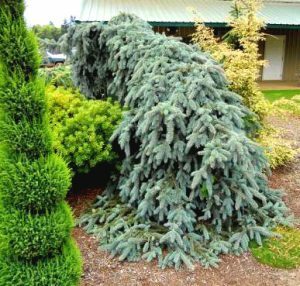 Portland, Oregon, with its cool summers, fertile soils and mild winters, has long been a region with the highest concentration of conifer nurseries in the U.S. With so many nurseries in one region, there is a heightened interest in finding new conifer varieties that may have commercial value. Creative horticultural techniques are constantly being developed to offer exciting new ways to present conifers, including multi-grafts and putting dwarf varieties on standards or short stalks to bring the tiny plant a few feet closer to the eye. One of the plants that is being widely grown is the stunningly beautiful weeping blue spruce called ‘The Blues’ – how fitting. The very uniform weeping habit or growth pattern makes this tree immediately recognizable from other weeping blue spruce cultivars. There are older specimens in several nurseries that provide proof that this plant will mature into a beauty, which is not always the case with new varieties. Sometimes a new variety will look particularly cute as a youngster, but have little appeal as a mature tree. Blue spruce, although a northern species, does surprisingly well in our hot humid summers. Once established this sun-loving tree, like many of the needled evergreens, is quite drought tolerant. The rate of growth is not as fast as compared to a more northern climate, but in many applications that is not an issue. An interesting result of the economic downturn is an improvement in the quality of plant material. Many nurseries have destroyed less than perfect material in their efforts to downsize. More advanced horticultural techniques such as top grafting, putting a dwarf conifer on a 2-3 ft. trunk to create a small tree, are popular. An example of this is the yellow upright growing yellow thread-leaf oriental arborvitae ‘Frankie Boy’. The top grafted result is an eye-catching chartreuse orb – very modern looking and perfect for an ultra modern home. The last trend I noticed is the number of nurseries offering rare conifers in smaller sizes. This should be popular for someone just getting started with conifers as rare varieties. These conifers, formerly only available in large and expensive sizes, are now available in smaller and more economical sizes, great for someone with a more limited budget. Now is the perfect time to consider adding conifers to your garden for four-season color, Fall planting allows time for some root development to occur as the ground is still warm and the stress on the rest of the plant is reduced with cooler temperatures. Be careful though, once you get hooked on conifers it’s next to impossible to stop. Then, there could be worse addictions. John Monroe is owner of Architectural trees, a rare conifer and tree nursery in Bahama, NC. His nursery has been featured in Our State magazine in the spring and on UNC-TV “In the Garden”.